Most of us are familiar with the term “Superfood.” What is not clear, however, it what makes these foods so beneficial to us. What separates a Superfood from their mild-mannered counterparts? The key difference relates to total nutrition. In addition to supplying the daily vitamins and nutrients that the body needs, Superfoods go above and beyond the call of duty. These types of foods will do everything from increase metabolism to assist in the detoxification processes of the body. Superfoods that have the highest profiles include members from all of the necessary food groups. In the arena of vegetables and greens, we have kale, broccoli, and brussel sprouts. The Superfoods that are the highest in proteins include specific nuts and seeds. Lentils, peanuts, and varieties of berries are just a few members of this large group of Superfoods. It has long been traditional wisdom that, within the world of berries, blueberries provide miraculous health benefits. Dark chocolate is perhaps the sweetest of the Superfoods that should be included in one's diet. This fact is among the most delightful of modern nutrition. Meats also have contenders that rank high among the Superfoods. Salmon and other fatty fish are renown for the omega vitamins and healthy oils which they provide. Including all of these ingredients into a daily diet has proven to assist in the body's natural ability to burn fat and increase the efficiency of digestion. Studies have also shown clear increases in immunization and the body's natural defense systems. Quicker recovery from injury and illnesses are also common among people who include Superfoods into their diet. Longevity is perhaps the most attractive benefits of this kind of nutrition. People that live well beyond their one hundredth birthday commonly report including these types of foods into their regular diet. However, many of us do not have the time to prepare foods like these on a regular basis. Most of us live life on the go 24 hours a day. Fast-paced lifestyles make it challenging to get the kind of nutrition that we all know we need. Thankfully, vitamins and dietary supplements are taking the key ingredients from these Superfoods and putting them into a form that can be taken on the move. 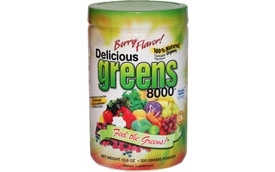 In the form of health drinks and vitamins, super food powders and products such as Delicious Greens 8000 are making a healthy lifestyle affordable and practical. Drinks such as these use only organic greens as ingredients, and they incorporate additional fruits for flavoring that are rich in antioxidants. Mixed with natural herbs and spices, being healthy has rarely been so flavorful. Increased levels of ionic trace minerals and flax lignans are just two of the critical ingredients that put products such as Delicious Greens 8000 above the rest of the health-drink market. The drink comes in many flavors, including chocolate and berry, all of which are flavored naturally. Each bottle contains 20 servings the fruits and vegetables that the body needs each day. Superfoods provide the perfect pick-up that your body needs. Rather than consuming 4 to 5 cups of coffee a day to maintain energy levels, make the switch to natural energy. Boosting the way that your body is functioning provides natural clarity of the mind and increases the energy reserve of the body. There is no easier way to quickly start yourself on the track to healthy, vibrant living. They also act as catalysts in the body chemistry as well as precursors to vital body factors. This enables the body to use carbohydrates, fats and proteins.